From flat water to small surf and everything in between, you’ll want a high quality SUP board that’s a best seller in every aspect. Good thing for you, the ISLE Airtech is just that! 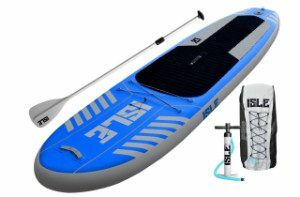 As ISLE Surf and SUP’s best selling inflatable paddle board, it features their patented Airtech Fusion-Lite Construction. It eliminates human-error in manufacturing by using a highly-controlled machine process that makes for a 30 percent lighter board than other iSUPs. You won’t have to worry about busted seams as the drop-stitch construction is sealed with a unique bonding layer and then finished with a machine-laminated, higher-density PVC layer. What does mean for you? All the bumps, crashes, and dings won’t mean a thing to the board! It’s ultra durable to take you from the shallow, rocky shores of the lake to where the waves break on the sea! The board is an excellent iSUP for anyone – kids and adults! It’s 10 feet long, 31 inches wide, and 6 inches thick to support riders of all skill levels. If you’re into yoga, this would be a rigid-enough board with lots of support to help you get some exercise and meditation in while out on the lake. However, it does max out at 240 pounds. The price point is a great feature to highlight as it includes some exciting extras. Expect to receive your iSUP, paddle, carry backpack, and a hand pump to get on the water as soon as you can open the box! The Airtech is a great all-round board for anyone who wants to enjoy the flat waters of the lake or light surf of the beach and rivers. However, if you’re a beginner SUPper, then you’ll appreciate its thick 6 inch dimensions for extra support while out on the water. Amateurs will never look back to starting out with any other board! Users of the Airtech iSUP love everything about it. It’s fast to inflate, feels like a hard board on water, and the tracking performance is excellent for its intended purposes. However, the black anti-slip pad does get hot when it’s out in the sun. But, sprinkle some ocean water on deck to help cool off if you’re barefoot. Also, there are a few complaints that the paddle is heavy despite its high quality construction, durability, and adjustable features. You might want to invest in a lighter paddle if it’s an issue for you and get a leash for it so you don’t lose it when it sinks! The other thing you may not like about it is being asked to the point of harassment if your board is a hard board, where you got it from, and can they borrow it! We’re pretty sure if these are your only complaints, you can live with it. What is the Recommended Max PSI for this iSUP? It pumps up to 15 PSI for optimal rigidity and stiffness without flex. Most users can get it to full PSI within 5 minutes and others take a little longer at 10 minutes. Is the ISLE Airtech iSUP a Fast Paddle Board? The Airtech is made for all-round and recreational use. You’ll compromise on speed with this iSUP to gain storage and carrying benefits. If you’re looking for speed for racing and touring SUPping, this isn’t the board for you. Does the iSUP have a Place On-Deck for Storage? It does come with bungee cords and d-rings on-board for storage. Take your cooler, waterproof speakers, waterproof phone, and anything else you might want to squeeze in! The included paddle is adjustable and made out of aluminum. While it may float for a little bit, it’s prone to filling with water and sinking. Many users will say it’ll sink like a stone. It’s best to use a leash to ensure you don’t lose the paddle. How much does the Paddle Weigh? The paddle weighs 42 ounces/2.62 pounds. You might want to opt for a carbon fiber paddle if you prefer something lightweight. Does the Airtech iSUP come with Front and Rear Carrying Handles? There is no handle on either the nose or the tail of the board for 2-man carrying. Instead, there is a middle carry handle in the center of the traction pad for 1-man carrying. How much does the ISLE Airtech Inflatable Paddle Board Weigh? Previous Airtech iSUPs used to weigh 25 pounds. However, ISLE Surf and SUP have started manufacturing and selling their Airtech’s with an approximate weight of 19 pounds. Does the Complete Package Include the Carry Bag? Previously, a carry bag wasn’t included in the complete package. That explains why many buyers say they didn’t get one or had to buy one separately. Now, the complete package does include a backpack carry bag with the Airtech iSUP package. Even at a discounted price, the Tower Paddle Adventurer iSUP will cost more out the door. But, it's another excellent all-round iSUP that'll get you SUPping in no time! It features the same black traction board that can get hot as well, but it comes with a 2-year warranty from a renown SUP brand. It can also hold more than 100 pounds of weight than the Airtech, maxing out at 350 pounds! Even though the Adventurer is slightly smaller, it can tote a heck of a lot more poundage! However, if you like everything about the ISLE Airtech but you do want a few more features, then you need to check out the ISLE Airtech Inflatable 11' Explorer iSUP! Not only is it longer, it weighs the same, maxes out at 275 pounds, has extra d-rings, and carry handles on both ends of the board. If you act fast, you can get the discounted price for a yard more than the 10' Airtech! 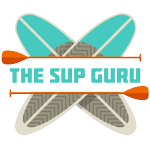 To SUP (sum) it up, the ISLE Airtech 10' iSUP is more than a beginner paddle board for beginner prices! It's just the right size for most riders as they paddle it out on the lake, rivers, and ocean. So, what'll it be? Calm waters for relaxation or light breaking waves for a feel-good workout?